Phoenix – March 9, 2017 -- Axolotl Biologix, an innovator in regenerative medicine technologies that improve patient outcomes with less pain and lower costs, today announced the appointment of Robert S. Kellar, Ph.D., as Chief Science Officer. Dr. Kellar will be overseeing Axolotl Biologix’s research and product development efforts, bringing over 16 years of research and clinical development experience from medical device and biotechnology companies. Most recently, Dr. Kellar served as an Advisory Board Member for Protein Genomics, Inc., a biotechnology company that focuses on research and development of biopolymers and their applications in wound healing, tissue regeneration, dermal fillers, and personal care markets. Dr. Kellar had a key role for building out the research program for Protein Genomics’ Elastatropin® an extracellular matrix protein that is an extremely important component of skin that provides strength and elasticity. Dr. Kellar will continue as an Associate Professor of Practice in Biological Sciences at the Center for Bioengineering Innovation at Northern Arizona University, and as the Co-Director of the Bioengineering PhD Program, the Co-Director of the Imaging & Histology Core Facility, and an adjunct faculty member in Mechanical Engineering. Dr. Kellar's academic laboratory is called the Tissue Engineering & Regenerative Medicine (TERM) Laboratory. His lab focuses on biomaterials, biocompatibility, cell & tissue culture, stem cell biology, and wound healing. Dr. Kellar is the Founder and President of Development Engineering Sciences, LLC, a biomedical consulting firm. He has experience in the development and regulatory approval of medical devices, cell-based products, and tissue engineered technology. Previously, Dr. Kellar was VP of Research and Development at Histogen, Inc. where he led multi-functional project teams for all aspects of product development. Prior to Histogen, Dr. Kellar was a product specialist for the first FDA-approved thoracic endograft at W.L. Gore and Associates where he served in a lead role in development, regulatory, clinical trials, marketing, sales, and business for the thoracic device and the product portfolio. Previous to this position, Dr. Kellar was a product specialist for the Global Oral Health Business at W.L. Gore & Associates (both Gore-Tex® Regenerative Membranes and the entire resorbable membrane portfolio). Prior to Gore, at Advanced Tissue Sciences, Inc. he led cardiovascular research programs and managed the Anginera® program. Dr. Kellar previously served on the Scientific Advisory Board for Theregen and the Advisory Board for Flagship Biosciences, a digital pathology company he helped co-found. He currently serves on the Scientific Advisory Board for MyoStim, the Board of Directors for the Surfaces in Biomaterials Foundation, the Advisory Board for Protein Genomics, and the Advisory Board for the California Stock Xchange. He earned his Ph.D. in 2001 in Physiological Sciences from the University of Arizona in the Biomedical Engineering Laboratory of Dr. Stuart K. Williams. Dr. Kellar is 42 years old. 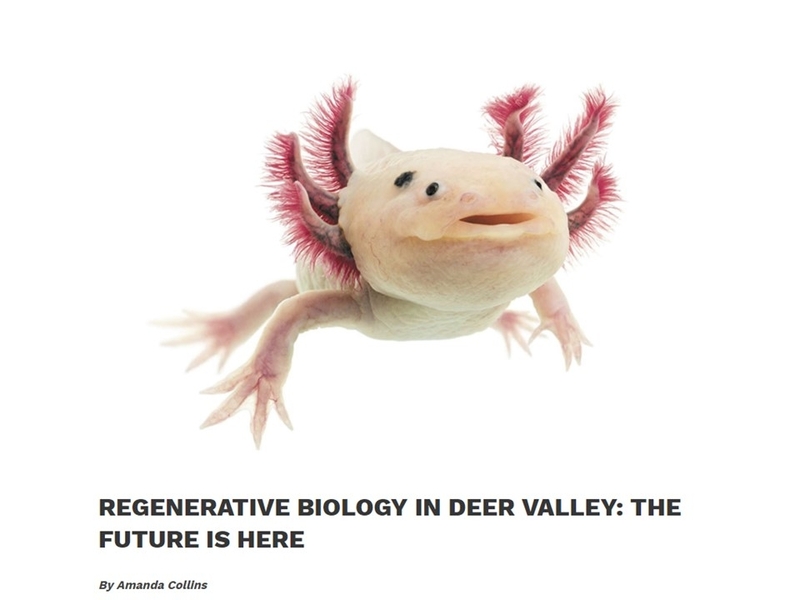 Axolotl Biologix, Inc., is a developer of innovative regenerative human cell and tissue medical technologies that is disrupting traditional painful and expensive treatment regimens for burn, surgical, trauma and chronic wounds. The company is rapidly building a portfolio of unique patented regenerative treatment products to improve patients’ outcomes with less pain and lower costs. Founded in 2016 by Bob Maguire, AxoBio already has two products in production. AxoBioFluidTM, a cryopreserved liquid allograft, and AxoBioMembraneTM, an amniotic allograft membrane patch, are targeted to advancing soft tissue repair, replacement and reconstruction. For more information, please visit the company’s website at www.axobio.com. Axolotl Biologix is headquartered in Phoenix, 1637 Knudsen Drive, Phoenix, AZ 85027.